Beets (Detroit Dark Red) – Devoured by mice before I could harvest them. Gopher baskets offered no protection. Will try planting in containers. Bok Choy – 11.90 lb from 9 plants, seeds started in February, last harvest in mid June. 9 plants provided a continuous harvest, will try staggering plantings to 3 at a time. Wire mesh box provided good protection from pests. Great steamed and in stir fry. Cabbage (Mammoth Red Rock) – 2.13 lb from 1 plant, seeds started in February, harvested late June, 1 plant left to harvest. 2 plants that were transplanted later were destroyed by rabbits since the cabbage plants were out in the open. 4 plants may be a good number, will keep the plants protected by wire boxes. 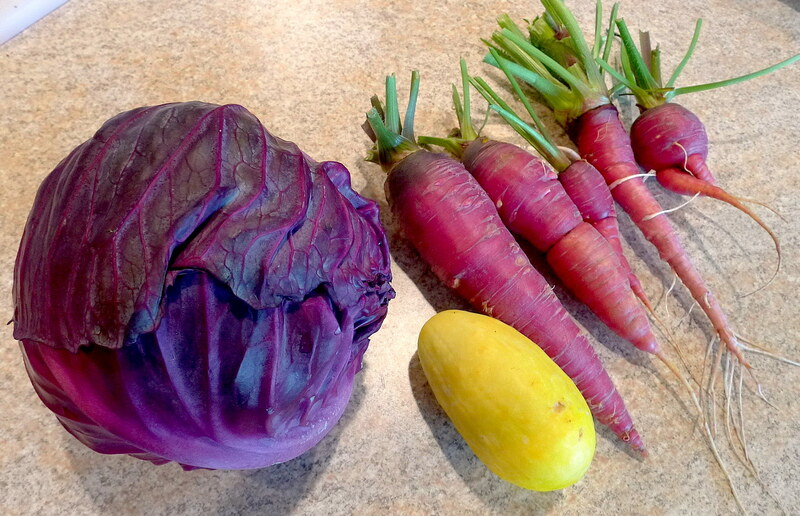 Carrots (Dragon) – 0.94 lb from 5 plants, seeds started in March, harvested late June. Leaves were partially eaten by pests, gopher baskets provided OK protection, except for the few carrots that had portions of the root nibbled on. Will try planting in containers. Cauliflower (Early Snowball) – Devoured by mice before the cauliflower heads had a chance to form. Wire mesh box provided no protection. May need to try container planting. Kale (Red Russian) – 15.75 lb from 6 plants, seeds started in February, still heavily producing. Wire mesh box provided good protection from rabbits, but leaves started being inhabited by aphids near the beginning of June. Suggestions for next season: reduce number of plants to 4, use row cover for additional pest protection. 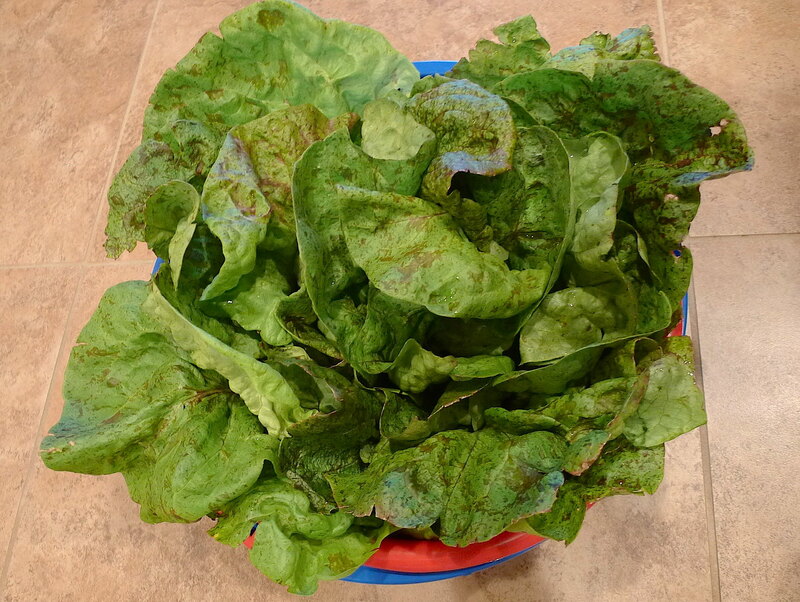 Kale chips from this variety were OK.
Lettuce (Speckled) – 2.1 lb from 6 plants, seeds started in February, last harvest in mid June. 6 plants at once provided a continuous but short harvest due to bolting. Will keep lettuce north or east of taller plants to give them shade. Wire mesh box provided good protection from pests. Great in sandwiches and for lettuce wraps. Peas (Golden Sweet) – Devoured before they could grow taller than ~6 in regardless of what protective devices I used. Currently attempting to grow peas in a container at home. Radish – Harvested too late and ended up growing too big and tough for eating. Next time harvest after just a month. Spinach (America) – Encountered difficulties raising the seedlings. Some seedlings already started bolting, even with just a couple sets of true leaves, and got infested with some small insects. Next time will grow seedlings in shade and protected by row cover. Growing a spring vegetable garden is uncharted territory for me, even more so in the desert wasteland of eastern Washington. There must be a reason this is the desert…nothing is naturally meant to grow here. Yes, there is a hint of bitterness in my tone. A premature unveiling of the cloches in conjunction with recent days of winds and fluctuating weather are making my spring transplants turn a complete 180. They appeared to have survived throughout the weekend and looked completely fine on Monday morning, but by the end of the day some of the bok choy, kale, and peas were wilting. Even a thorough watering didn’t help. Today, I found half of my peas chomped in half by some parasitic creature, the rest of the unsheltered leafy plants shriveled like raisins and faded in color. I couldn’t find any useful or detailed information on spring vegetable gardening in the desert online, particularly THIS desert. I made the mistake of removing the plant protection too early, but I also faced the dilemma of the plants growing too big to fit within the plastic drink bottles (some of the leaves that were being pushed up against the walls of the bottles appeared to be yellowing/browning at the edges). So what alternative did I have? It’s too late now to restart these plants. Maybe my best bet would have been to construct hoop houses for the spring garden (however, this is something I don’t think I should invest in yet given that my residence here is temporary). Or, I should just swallow my pride and admit that I can’t grow spring plants in this climate, give it a rest, and just focus on the heat-loving vegetables for the intense summers here. C’est la vie. At least I still have my root crops.